Samuel "Sammy" Miller is famous amongst the motorcycle community for an incredible career involving road racing, grass track racing and motorcycle trials. 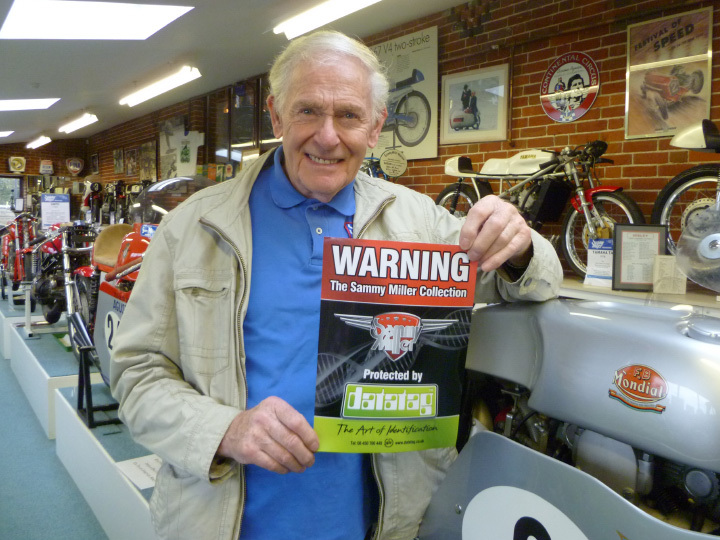 Sammy's titles include 3 victories at the North West 200, a 3rd in the 1957 250cc Grand Prix in championship, 11 British Trials Championships, 2 European Trials Championships 9 gold medals and a win at the International Six Days Trial. These days Sammy takes things a little easier and fortunately for bike fans everywhere has set up one of the most priceless collections of historic and exotic working road and race bikes in the world housed in the The Sammy Miller Museum. Based in Hampshire the Museum houses both the rare and the interesting including Sammy's Championship winning ex-works 1957 Mondial. 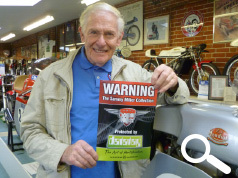 To help protect this irreplaceable collection Sammy recently turned to leading security specialist and the technology behind the Motorcycle Industry's MASTER Security Scheme, Datatag. Datatag's unique layered approach provides the most technologically advanced security marking available and importantly for the collection is 'invisible'. The system uses UV etching to permanently mark components thereby ensuring that the visual impact is negligible. The UV marking is reinforced by discrete RFID transponders and Datadots fixed with a unique DNA solution. Removing all trace of the identifying marks is virtually impossible and as such provides an effective deterrent to theft. Readers can protect their own bikes with the same technology by fitting a Datatag Motorcycle Security System of their own. Not only that but BSN has teamed up with Datatag to offer readers visiting the upcoming Motorcycle Live event a special kit price of just £67.50. Simply present the Datatag advert from the bottom half of the page when buying a system at the NEC to take advantage of this great offer – you'll also get a free gift! Those who can't make the show can still protect their machines for a one off cost of just £89.99. Available through local motorcycle dealers a Datatag kit is a small price to pay for peace of mind and can easily be transferred to a new owner should you sell your bike.